I must confess, for a guy who prides himself on ecumenicalism in music, I have my closet prejudices, and hence pockets of ignorance. New Orleans, both Dixieland and Bayou Blues of all sorts. Neil Young. Ornette Coleman. L.V. Beethoven. My loss, each, I know, and I do try to combat these lacunae, not defend them. I understand that it’s my loss, not Beethoven’s or anyone else’s, if I have failed to develop a taste for his music. Ludwig ain’t crying on his pillow over Jeff not listening to him. There are, however, many people lying awake thinking running LV’s scores through their mind, being entranced and enhanced by them. My limitations, my loss. Ignorance isn’t bliss, it’s ignorance. So if I’m enumerating my musical transgressions, chalk up pre-1948 jazz, pre-bebop; i.e., big band swing, Louis Armstrong, Bennie Goodman and lots of others I struggle unsuccessfully to appreciate. The one gentleman from this idiom that I have succeeded in warming up to to a certain degree is Edward Kennedy “Duke” Ellington (1899-1974). 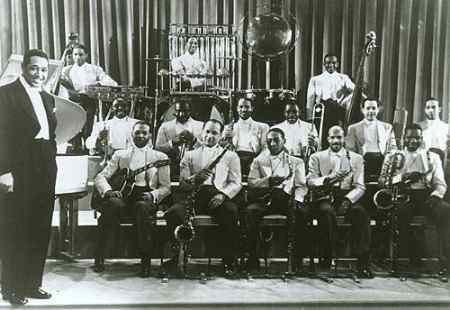 He led his big band from the mid-20s in Harlem, through the boom years of the big band in the 30s and 40s. After the war, the dance floor fell out from under the swing bands and the lindy hop. Almost all of them folded, only Count Basie and Stan Kenton holding on for a few more years. ‘Duke Ellington and His Orchestra’ thrived, toured the world, continuously broke new ground in jazz (the legendary 1956 Newport Jazz Festival performance) and in contemporary classical music. He was loved, respected and revered, a towering figure throughout the music world. He was a gentleman (his father had worked as a butler in the White House), a sophisticate, a hypochondriac, a womanizer and a major-league macher. He was both generous and a manipulator, a man of great appetites. 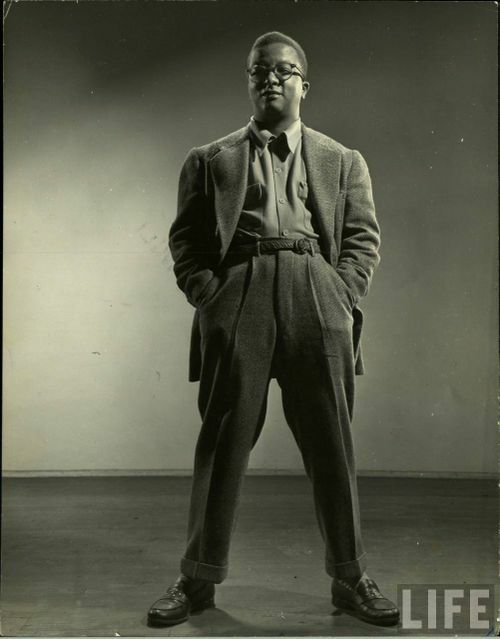 His success was due to his great talent as a composer and performer, his ability to manage (notoriously difficult) jazz musicians, his business acumen, and his collaborator, Billy Strayhorn. Billy Strayhorn (1915-1967) was born and raised in a poor ghetto home in Pittsburgh. A prodigy on the piano, he taught himself the classical repertoire and, after he made it, all the trappings of the debauched lifestyle of an openly homosexual effete. But now we’re talking poor Pittsburgh black, 1938. According to the version of the story related by David Hajdu in his very fine biography of Strayhorn, “Lush Life”, on December 2 of that year, David Pearlman, a (black) friend and fan of the 23-year old Strayhorn went with a friend, David Greenlee, to see a show of the touring Ellington Big Band. Greenlee also happened to be Ellington’s nephew. Backstage, Greenlee told Duke that they had a friend who wrote music and would like to play for him. Greenlee had never heard Strayhorn, but Duke invited them back the next day before the matinee. Billy, calm and dressed in his well-worn Sunday best, sat down at the piano and said, “Mr Ellington, this is the way you played ‘Sophisticated Lady'” and proceeded to play it exactly like Duke. “And this is how I would play it.” And he gave him a hipper, more challenging rendition. Duke asked him to play some of his own compositions, then asked him a million questions. 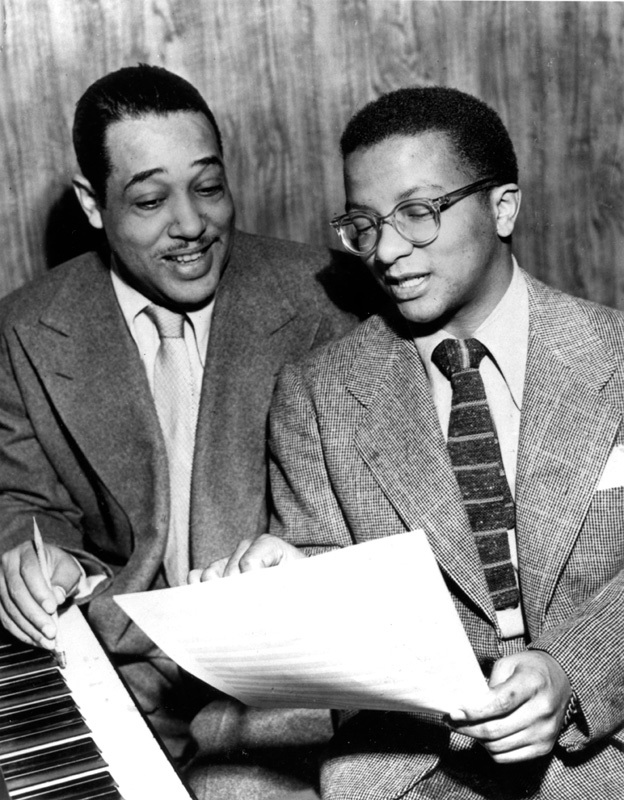 Years later, Ellington said that what most captivated him was Strayhorn’s laugh. Over the next few days, Ellington gave Billy some arranging assignments. Strayhorn wrote them out, Ellington handed out the scores to the band on-stage. It went well, to say the least. “I would like to have you in my organization. I have to find some way of injecting you into it. I have to find out how I do this, after I go to New York,” Duke said. And he gave young Billy a note with subway directions to his apartment on Edgecombe Avenue in Harlem. But then Strayhorn heard nothing. And he was hungry, literally. So he decided to take the chance and go to New York to look up Duke. But he didn’t want to show up empty-handed. So he took the note Duke had written him with the directions. The note started, “Take the ‘A’ train…”. And he composed what was to become the theme song of Duke Ellington and His Orchestra, one of their biggest hits, and one of the masterpieces of the only art form originating in North America–over 2000 recordings of the song, according to All Music Guide. Soon you will be on Sugar Hill in Harlem. Ellington not only hired Strayhorn on the spot, he took him into his home, the elegant penthouse where he lived with his long-time lover (his wife lived elsewhere) and with his sister. 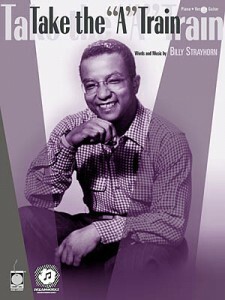 Strayhorn wrote for Ellington, arranged for him, became his shadow musical alter ego. Ellington rarely expressly credited Strayhorn’s contribution in writing, but kept him on a generous regular salary, supported his extravagant life-style, befriended him, loved him. Their collaboration lasted till Strayhorn’s death in 1967, and was in fact a thing of wonder—their voices were virtually indistinguishable. In Strayhorn’s words: “I have a friend. And this friend has an orchestra, and this friend travels with this orchestra fifty-two weeks a year. He refuses to take a vacation, and this has been going on for years. Every once in a while, this friend calls me from some place I’ve never heard of, from some distant part of the world and says, ‘Billy, I’m working on a song, but I’m stuck, can’t finish it. Now, the first part goes like this: Bah bah bah bee boo bee bee bah bah bah bah bah boo. I want you to finish it for me. Call me back tomorrow morning. Or in ten minutes. And tell me how you finished it. Duke Ellington and His Orchestra recorded “Take the ‘A’ Train” often over the years. The version attached is the original, recorded February 15, 1941. You can also hear it here on the Smithsonian site, along with some other great versions. Here’s a great one recorded in a railroad car in 1943. Here’s the Duke in a trio setting. Here’s the Ellington Orchestra backing Ella Fitzgerald. And here’s one from 1965 with Strayhorn joining the orchestra on stage. This is first and foremost dance music. Ellington intros on piano, followed by the reeds playing melody in the first verse, with the brass playing one or even two contrapunctal lines behind it, Ellington comping on piano. In the second verse, Ray Nance paraphrases the theme on a muted trumpet as the reeds dance elegantly behind him. A showy flourish of modulation by the entire ensemble, then the band embellishes the second sentence of the theme with Nance soloing above them on the unmuted trumpet. Another flourish by the horns, then the final verse in which the ensemble gently swings the theme. I love the story behind the song, I am very fond of the song itself, and I liked it even more while giving it a close listen to write these lines. Know what? Maybe I’ll spend some time now making yet another effort at snuggling up to this great 1940s big band music. If I can get inside its heart and its head and its feet, I’m sure I’ll enjoy it, as so many others have.